These words are printed in white letters on a black t-shirt. 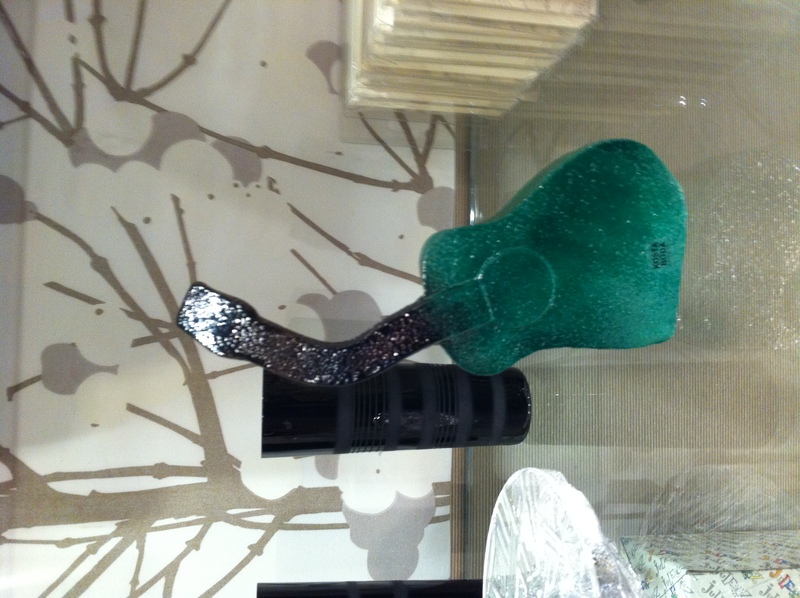 I am in the gift shop in The Kennedy Center in Washington D.C. There’s a green crystal guitar sculpture on a shelf next to the t-shirt. The flipper of a cooking handle is shaped like a violin. Piano keys inspired salt and pepper shakers, trays, and mugs abound. I recall a paper weight I had bought for a friend many years ago. It’s a sculpture that looks like a crushed music sheet. She’s a musician so it seemed like an appropriate gift. I’ve also given her a rock band, i.e., frogs playing a variety of musical instruments. At home I have a toy of a little Native American girl asleep on a large drum. I also have a very large real drum in the center of my living room which I use as a coffee table. Music translates into visual inspiration. This time I don’t buy anything. It’s time to go beyond ‘collecting’ musical inspirations.